Manchester City and Borussia Dortmund take on each other in the sixth International Champions Cup (ICC) with each outfit looking to make the most of a competition that runs right up until the start of the European domestic season. City enjoyed good early form in last year’s edition of the competition, winning two of their first three games, but they face a test here having never beaten Dortmund inside 90 minutes. The German side will be looking to make amends for a less than inspiring season, while City enjoyed a momentous Premier League campaign taking the title with a record a points tally, goal difference and margin over second place. 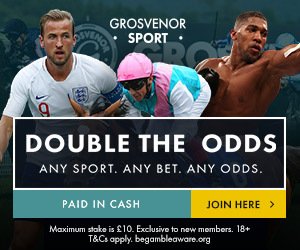 The two teams met in the 2016 ICC, drawing 1-1, which was Dortmund’s only appearance in the competition until now and it’s a decent 13/2 price with Grosvenor Sport for a repeat score line this time around. Read on for some more of our best football betting tips for this International Champions Cup meeting. With the World Cup having only just finished and the European domestic season not far away, Manchester City will put forward a youthful squad for their trip across the Atlantic, with manager Pep Guardiola using the opportunity to give some minutes to some of his younger players. The Cityzens have 16 players absent as they recuperate after their international duties at the World Cup, so estranged goalkeeper Joe Hart could make an appearance, whilst new signing Riyad Mahrez should also feature and will surely be eager to prove what he can do in a lighter shade of blue following his £60 million arrival from Leicester City. City are the 15/8 outsiders to take the game but I think they could be worth a punt, with a named squad consisting of a mix of players all keen to make an impression for a variety of reasons. Borussia Dortmund are able to field a stronger first XI as they have less players still off recovering from their summer duties, but nonetheless still face a number of absentees, giving City a fighting chance. With the fixture taking place in Chicago, both teams will be looking to make the most of the chance to garner more fans and support in the US and so I think it could be worth a punt to back a game of goals as part of a crowd-pleasing display. Over 3.5 goals at 12/1 could prove fruitful, with the ever-dangerous Leroy Sane looking to re-establish himself after being dealt the blow of not being taken to Russia as part of Joachim Low’s German World Cup squad. Conversely, Dortmund’s Maximilian Phillip will be full of confidence after netting nine times last season and looks likely to be starting upfront, adding weight to a potentially high-scoring affair.